Let me introduce myself. I am Hisashi Ikenaga（Markezine's Author information：http://markezine.jp/author/54/）,IT journalist &Monetizing adviser(consultant) acting in Japan. 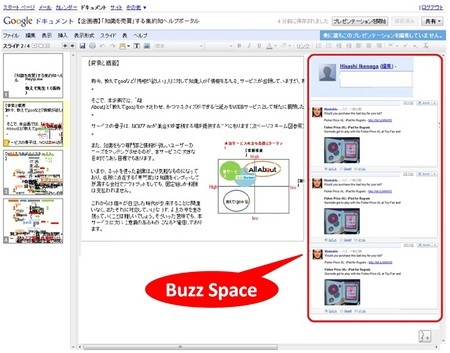 Now,regarding primary heading,I propose new useage (or offering way) of Google Buzz. It seems very interesting to plug-in Google Buzz(newly offered by your company) with Google Docs. 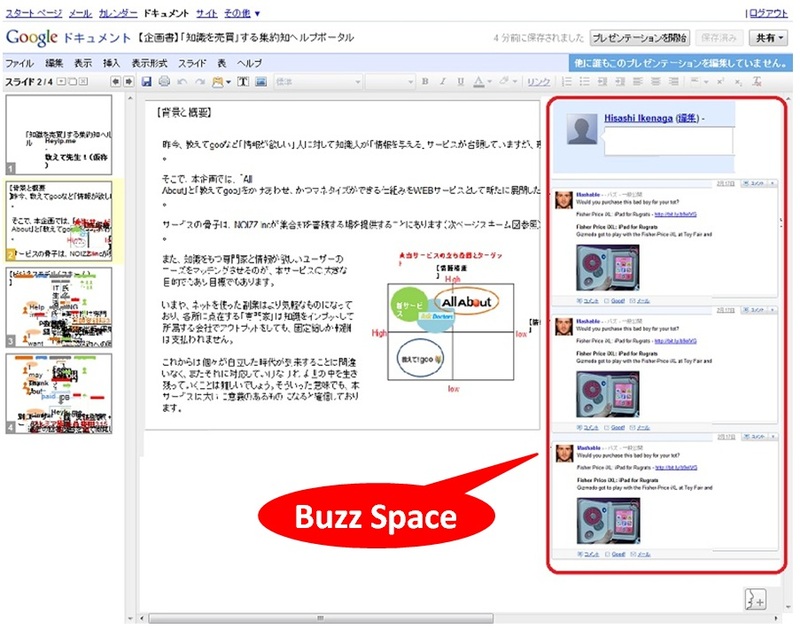 You can see that Google Buzz will be very useful on Meeting and Press conference. In case of finishing Meeting and Press conference,you can make simple discussion on Q and A session,however it will be impossible to make session on real time. Then Google Buzz comes up ! Say,you make press conference after plug-in Google Buzz with Google Docs. Before starting press conference,you should invite press person by useing the Google Docs account which upload slide show ( PPT,PDF etc) for the conference. By doing this, in press conference,lecturer make speech and MSG posted Google Buzz is displayed at the same time.So press person who are there feel that,any time asking and info shareing among them. ※ Please attached find the UI( User Interface ) and image on Powerpoint which I made for your　reference. If you can realize above method,it will be possible that industry side can accept Q&A in real time and put the information out promptly to press person. And also, press person who are there can realize the questions on real time and share the information which is done by other press one. Attention: In case of Q&A on real time in press conference,2 persons are necessary. One is lecturer who use Google Docs,and the other is respondent. If you can accept the above method,many user expect to use the system in conference. Google Buzz should be monetized by the method which I mentioned above By doing this,service user on Google Apps premium will more increase. I am now planing to release above proposal on Markezine,one of Japanese WEB site.